by Gary L. McIntosh. Baker Press, 2009. Leading church growth expert Gary McIntosh offers this helpful guide to orient congregations to move through age and growth cycles. 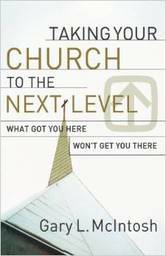 He identifies five phases of church life: emerging, growing, consolidating, declining and dying. The characteristics of each phase provide unique challenges and opportunities. The second half of the book is specifically about size transitions. The core of church growth is to make committed disciples in whatever size congregation one serves. But leadership styles, management issues, communication styles, staffing, and congregational culture change as congregations grow. There are five sizes of congregations mentioned: the Relational Church (15 to 200 worshipers), the Managerial Church (200 -400), the Organizational Church (400-800), the Centralized Church (800 to 1500), and the Decentralized Church (1500+). McIntosh introduces “change points” for dealing with each. Church growth requires continual improvement in order to overcome negative impulses which confront each stage and to be faithful to its ongoing mission.